What is Tissue Expander/Implant Reconstruction? What is the definition of Tissue Expander/Implant Reconstruction? The simplest option for breast reconstruction is to have breast implants alone. This option is best for patients who have medical issues that prevent them from having a more complex surgery, as well as patients who understand the limitation of this type of reconstruction but want to have a breast mound. The breast implant option is usually completed in two phases. The first surgery consists of placing a tissue expander in the breast area underneath the skin and chest muscle. 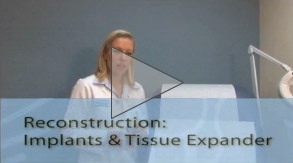 The tissue expander, which can be expanded like a balloon, will be gradually filled by adding a salt-water solution approximately once every two weeks. Once your skin has stretched, in about three to four months, the next surgery will replace the tissue expander with a permanent saline or silicone implant. If you do not need the tissue expander, your surgery will only consist of inserting the implant. Although implant breast reconstruction is the simplest, it carries the highest incidence of complications. A breast implant reconstruction is not the same as a cosmetic breast augmentation procedure. In cosmetic breast augmentation, the breast implant is placed underneath normal breast tissue, which cushions the implant and therefore allows the breast to have a natural shape and feel. After mastectomy, the breast skin is thin, and due to the lack of breast tissue, the implant is readily felt. The implant is placed under the pectoralis muscle to improve the feel of the implant as well as to minimize infection and problems with scarring around the implant. The lower part of the implant will not be covered by muscle. Often, a collagen sheet is used to cover the lower part of the implant to improve the cushioning of tissue over this area. However, implants may become infected or the tissue around the implant may become scarred and firm in the future, and this needs to be taken into account when considering this option. To learn more about what type of Houston breast reconstruction procedure is right for you, and more about breast implants vs. breast tissue, please contact us by filling out the form on this page. Pre-operative Labs: Preoperative lab work must be obtained and reviewed prior to surgery. The lab work will need to be completed 3 weeks prior to surgery. You may also be requested to do a cardiac work-up before your surgery. Medications: Do not take any medication containing aspirin or anti-inflammatories (Advil, Aleve), including cold formulas, for at least 2 weeks prior to surgery. Please let us know if you are taking or have been taking any herbal supplements, fish oil or vitamin E. These will need to be discontinued 2 weeks prior to surgery. Please refer to the Medication List link for some frequently used medications that contain aspirin or an anti-inflammatory. These compounds have a tendency to decrease the average clotting capacity and increase bleeding during surgery. Tylenol may be used instead as it does not have these untoward effects. If you are on Tamoxifen, you need to stop taking this medication 2 weeks before surgery. Smoking: Smoking compromises blood flow by causing spasm of blood vessels and significantly increases the risk of mastectomy skin complications and wound healing problems. Therefore, DO NOT SMOKE for at least 8 weeks before and 6 weeks after surgery. This also applies to second hand smoke; therefore do not stay in the room with cigarette smokers. Hibiclense®: Use Hibiclens® (over-the-counter antibacterial skin cleanser) in the shower instead of soap for 3 days prior to surgery. Apply the minimum amount of Hibiclens® necessary to cover the skin from shoulders to thighs and wash gently. Rinse again thoroughly (be careful not to get the product on your face, eyes, or ears). You do not need a prescription for Hibiclens. Notification of Illness: Notify our office promptly if cold, fever, or any illness appears before surgery. Call in any allergies, medications, or conditions you may have forgotten to tell us about. Arrival for Surgery: Please be punctual. If you are running late please call ahead, but be aware that not arriving on time may cause cancellation of your surgery. Please report to the Methodist Hospital, 6565 Fannin, on the 3rd floor of the Main building, Main 3 NW. Their phone number is 713‐441‐1034. You may be discharged from the hospital with drains in place. There are usually 1 to 2 drains in each operated breast. It is necessary to record total daily output for each drain. When the drain is near full, empty the contents into a measuring cup and record the amount in milliliters (equal to cc). Strip the drain tubing as instructed several times per day to remove any clots that could prevent proper draining. If the drain requires emptying more than once per day, enter the DAILY TOTAL in the appropriate space on the Drain Output Record. The drains will be removed when the output of each drain is less than 25cc (mL) in a 24 hour period. We use silastic drains, which reduce any discomfort during removal of the drain. You should continue taking antibiotics until your last drain has been removed. The small opening that will remain in the skin will seal in 24-48 hrs. This opening may have a small amount of drainage, and can be covered with dry gauze until it seals closed. You may have brown steri-strips applied over your incisions. These will remain in place for approximately two weeks. We may remove them in the office during your clinic visit. After showers, pat dry the incisions. Most of the incisions have absorbable sutures that are hidden underneath the skin. It is not uncommon to sometimes feel a small suture knot in the incision area. If this does happen, it will be removed during your clinic visit. You will be able to shower 48 hours after surgery. Baths can be resumed 1 month after surgery, and swimming 8 weeks after surgery. After surgery, your breast(s) will feel swollen around the incision, especially at the end of the day. This is normal and usually takes at least a month or more to resolve. If you have adjustable implants or tissue expanders, you may also notice that the implants are not fully expanded. This is to allow the mastectomy to heal, and the full expansion is usually performed in increments in the office. You may be discharged with a post-operative surgical bra. This should be worn during the day for at least 4 weeks after surgery. This is a soft bra that does not cause compression issues on the reconstructed breast. You may purchase additional post-operative bras through our office for $30.00. A receipt will be given to you that you may submit to your insurance for any reimbursement. Once the drains are removed, you may be given a prescription for a moderate support, cotton, non-underwire bra. This garment can be obtained from a recommended specialty store and is often covered by your insurance. When you are discharged from the hospital, you will be able to take short walks and climb stairs. You may resume regular activities 1 week after surgery. You should not lift anything heavier than 10 pounds for the first four weeks. After that, you may gradually resume your exercise routine and can return to full active status 6 weeks after surgery. You should only sleep on your back and avoid sleeping on the reconstructed breast for at least 6 weeks after surgery. If you prefer, you might find a recliner helpful to prevent you from rolling on your side while sleeping. You may start driving after your drains have been removed and you have stopped all your pain medication. It is best to wait at least 2 weeks after surgery, in order to feel confident when driving. You will be able to return back to a desk job, or light duty at 2 weeks after surgery. Be mindful that this should be gradual because you will feel more tired and lack the normal reserve of energy. After the incisions have completely healed, you can start applying pressure massage and moisturizer to the incisions to improve the appearance of the scars. Your scars will have a red appearance for approximately 6 months after surgery but will gradually lighten as they mature. A routine mammogram does not need to be performed on the reconstructed breast. However, it can be performed if requested by your oncologist or other physician. You should still perform a self-breast exam on the reconstructed breast and keep note of any changes in the scar and breast skin. Ask your friends and family to help you with chores and errands while you recover. Please carefully review the activities section. This will help you become more aware of your limitations.